Hahaha! I could have been a fake book without pages, just to be a show-off and impress guests. Man, that’s pathetic – books are made for reading, not fetishism. Gotta torrent me some pdfs and cause more butthurt in greedy publishers, lol. Normally I wouldn’t reply back to internet trolls, but this deserved special attention for its post-worthy discussion. First off, I didn’t quite get the “I could have been a fake book without pages” part of the argument. Grammar rules aside, I’m guessing the whole point of the comment was that my post gave the impression that I’m some sort of egoistic, attention seeker who buys books for others to see (I’m actually the complete opposite, believe me). Clearly, this person has no idea what “Collection” means. I’ve said this more than once. I prefer to use paperbacks for all the heavy-duty stuff of reading and researching, rather than using hardbound, elegant copies. 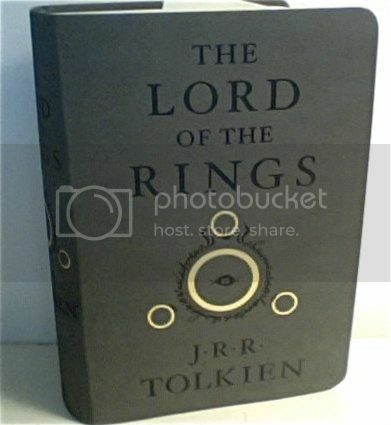 If I acquire a Delxue Edition of The Hobbit, I’ll admire its external shell. The contents are the contents. But it’s part of being a collector, I guess. It is a feeling of owning a piece of literature, and an edition/cover that makes justice to the classic story itself. If I get my hands on such a book, it goes straight on my shelf and stays there. Viewing the collection I wrote about is purely for my own appreciation and no one else’s. The point of those posts was to share my collection with other collectors and discusses with each other our admiration for such books. … doesn’t mean anything beyond simple admiration and fascination at the craft employed to produce the book itself. But to each his own, of course. And I’m not even going to delve into the “torrent” and “pdfs” part of the comment – which further adds to this individual’s lack of appreciation towards books. Not least, admitting to illegal activity. So what should we get from this post? Absolutely nothing. That’s what nasty trolls do to you. that’s just bizarre. Without the great book collectors of the world, people who collected because they loved the objects as much as the contents, many important pieces of the cultural heritage of the West would have been lost. And there’s a lot of pleasure in a well made object — whether it be a book, a piece of porcelain, or a chair. Yes there is indeed a lot of pleasure that can be attained from purchasing a new, or rather very old, piece of beautiful literature. Sure, you can go ahead an buy an ebook, which most likely has the most modern edited version of the text, however, there really is nothing like sitting back and investigating all the great work that goes into hand-bound books. Thats why I have invested a lot of my time into researching and eventually purchasing rare and limited edition books. For those people who claim that I buy them for the purpose of showing off, just like James mentioned that this guy seems to imply, is that I keep them out of the public eye. They are all stored away in my personal chambers and out of sight of any guests. Should someone ask to see it I will of course kindly show them, but I do not intentionally show them off. James, this person obviously has no notion of what a great book, or any book for that matter, truly is. Only those who have experienced the pleasure of holding one can really know what it feels like. So don’t be angry at this person, or other like him, rather, pity them for what they have yet to experience…if ever they will. Pity is the right word Steven. Definitely have nothing against this individual, but I felt it necessary to bring to light one example of such “trolling” in relation to collecting. A beautifully edited book is (or could be) undoubtedly a piece of art. If you can’t bear your loss, you are lost. Trolls know only a price of a book, not its worth. On the other hand however, as the collector, don’t you feel or consider yourself sometimes like, let’s say, the Elvenking fascinated by “white gems” ? This is our “weakness”, I suppose. That’s why these rude remarks made by trolls cause real pain. But don’t worry, trolls turn into stone sooner or later, I am sure of it. I can’t believe that person’s view. Especially in this age of e-books and the Internet, I value books more than anything. I consider myself a very avid reader (especially of Tolkien’s works!) but I also understand collecting editions. Before I realized what a daunting task it would be, both for the budget and otherwise, I had hoped (as a child) to acquire every edition ever published of The Hobbit. Obviously, that would be fairly unrealistic, but now I have my sights set on collecting some of the more beautiful editions of the works on Middle-earth. As a side note, what is the edition officially called that is in the photo at the header? A very beautiful box set. Good catch about the image of the books and the site header. Those are the Deluxe Editions, which you can find here: Exclusive & Deluxe. (You can also find these on Amazon and others). What can be said about that individual beside beside he has probably no idea what a book is ? Generally speaking, I think books are the most beautiful things that ever existed… and a shelve full of books is the most beautiful piece of furniture you can have in your place. It says a lot about you (that you love to read, you’re cultivated, and what kind of books you like to read, etc. ), and I’m never so comfortable in someone’s place when it’s full of books. Trolls need to be ignored or their lack of common sense and social skills pointed out and ridiculed. Either way theu won’t get the attention they seek or get the wrong attention. Clealry the argument of the troll above is not worth your time and lines. I’d say forget about it and think of all your loyal fans that enjoy your blog, articles and reviews and share your passion for Tolkien. Trolls in most cases are very sad creatures indeed that lack all of the creativity they relish in criticising. So **** them and onwards to victory. Pathetic is the right word, to describe his crappy attitude. Haters are always gonna be haters. First of all, books are one of the wonders of the world, regardless of whether they’re by Tolkien or not. Secondly, one does not simply torrent a book and expect to get a real living experience out of it. There’s a special je na sais quoi quality to holding a collector’s edition book in your hands, with the smell of those old pages wafting up your nostrils. I happen to own the Silmarillion, the LotR trilogy, the Hobbit, as well as several Tolkien biographies and the first few books of ‘The History of Lord of the Rings’. How long have you been collecting Tolkien? I’m relatively new (about 4 years), but I still love it more than any other book. Probably a devotee of Harold Bloom, LOL. I have a collection that just keeps growing. I won’t stop anytime soon. I even recently purchased a children’s bio. of Tolkien. “Greedy publishers,” huh? Okay, so here’s the inside deal about retailing books for those of you who may not know, from the perspective of an author who is publishing with a New York publisher (my book comes out in September and you can pre-order it from all the book sites now). As a writer, my contract states that I get 7% of retail value for each book sold. This is an exceptionally generous contract for a publishing house, especially for a new author; that’s just how my publisher rolls. So my book is worth $20; I get a dollar forty for each one. It took me two years of writing and one year of editing negotiation to complete my book, devoting about the same amount of time to it as a part-time job. The books are sold to retailers from the distributors for a 40% discount on the cover price; so they pay 60% of the cover price (and I know this because I used to be a bookstore owner too). So of that $20, I have $1.40 and the distributor has $12. Now the distributor has to store the books somewhere (which requires owning or renting a warehouse, plus utilities) and ship them from the publisher, plus advertise, pay staff, and pay for websites and catalogues. I don’t know for sure but I’d guess that they probably pay a wholesale price for the book, so let’s say $8 makes it back to the publisher. From this money they have to a) hire staff: editors, copy editors, typesetters, publicists, media managers, artists, webmasters, printers, etc. b) pay fees: shipping, advertising, promotion, banking, licensing of copyrighted content, web fees, promotional material, reviewing, shipping, etc. c) actually print, bind, laminate, and label the books d) store books e) handle mail and email sent to authors with their label f) rent or purchase a place of business, including all staff, supplies and utilities. Keep in mind, also: a) books not sold can generally be sent back to the publisher with a ripped-off cover, who then have to dispose of them; b) no one makes any money on second-hand books other than the second-hand bookstore owner; c) e-books don’t have as much overhead (no printed book to make or store or dispose of) but otherwise require all the same work a physical book does and it makes much less money. Believe me, the “greedy publishers” earn their keep. Pay what a book is worth and do the decent thing. By all means try before you buy on pdf; but then buy it if you like it, and buy it new if you can. Thanks. That copy looks gorgeous … out of curiosity, which version/edition is it? It’s the Harper Collins 2004 edition, which is a 50th anniversary copy. I’m not trolling, I just see his point. Particularly with Tolkien, as the world he creates lies within the words and sentences, not the cover. Say what you want, but I’ve read Lord on dishevilled paperbacks given to me by my first love, as well as digitally, and the difference is nil. As for torrents, I’m reading “The Children of Hurin” which is available as a torrent from its resting site in Archive.org. If thats illegal, somebody ought to tell Christopher Tolkien, because you don’t need a torrent at all, just go to the site. I do enjoy the sight of the books, but only because I made a bookcase specifically for them with my own two hands. However, that IS kind of ‘pathetic’ and fetishistic, but a little of that in life does nobody any harm. And yes, I could very well have simply made a front that would look like the covers of a first edition but had nothing inside but empty pages, but that would be REALLY pathetic! I never read the initial blog post, and I fully agree that his tone is inexcuseable, but I do see his point. And no offense to the writer above, but you might want to wait to see just how much promotion you get for your book before you sing their praises. There’s a reason why most of those ‘how to get rich’ books were published by self publishers. I really have to say, anybody paying $20 for a book nowadays, is a real sucker.